"Asian Exclusion Act" redirects here. It is not to be confused with Chinese Exclusion Act. The Immigration Act of 1924, or Johnson–Reed Act, including the Asian Exclusion Act and National Origins Act (Pub.L. 68–139, 43 Stat. 153, enacted May 26, 1924), was a United States federal law that prevented immigration from Asia, set quotas on the number of immigrants from the Eastern Hemisphere, and provided funding and an enforcement mechanism to carry out the longstanding ban on other immigrants. The 1924 act supplanted earlier acts to effectively ban all immigration from Asia and set a total immigration quota of 165,000 for countries outside the Western Hemisphere, an 80% reduction from the pre-World War I average. Quotas for specific countries were based on 2% of the U.S. population from that country as recorded in 1890. As a result, populations poorly represented in 1890 were prevented from immigrating in proportionate numbers—especially affecting Italians, Jews, Greeks, Poles and other Slavs. According to the U.S. Department of State Office of the Historian, the purpose of the act was "to preserve the ideal of U.S. homogeneity." Congressional opposition was minimal. A key element of the act was its provisions for enforcement. The act provided funding and legal instructions to courts of deportation for immigrants whose national quotas were exceeded. The act was revised in the Immigration and Nationality Act of 1952 and replaced by the Immigration and Nationality Act of 1965. The Naturalization Act of 1790 declared that only people of white descent were eligible for naturalization, but was modified in 1870, when eligibility was extended to people of African descent in the wake of the Thirteenth and Fourteenth Amendments. Chinese and Japanese people were barred from immigrating to the U.S. in the 1882 Chinese Exclusion Act and the (unenforced) Gentlemen's Agreement of 1907, respectively. According to historian Mae Ngai, before World War I, the United States had "virtually open borders". A limitation on Southern and Eastern European immigration was first proposed in 1909 by Senator Henry Cabot Lodge. The Immigration Act of 1917 further restricted immigration from Asia. In the wake of the post-World War I recession, many Americans believed that bringing in more immigrants from other nations would only make the unemployment rate higher. The Red Scare of 1919–1921 had fueled xenophobic fears of foreign radicals migrating to undermine American values and provoke an uprising like Russia's 1917 Bolshevik Revolution. The number of immigrants entering the United States decreased for about a year from July 1919 to June 1920 but doubled the year after that. Congressman Albert Johnson and Senator David Reed were the two main architects of the act. In the wake of intense lobbying, it passed with strong congressional support. There were nine dissenting votes in the Senate and a handful of opponents in the House, the most vigorous of whom was freshman Brooklyn Representative and Jewish-American Emanuel Celler. Decades later, he pointed out the act's "startling discrimination against central, eastern and southern Europe". Proponents of the act sought to establish a distinct American identity by preserving its ethnic homogeneity. Reed told the Senate that earlier legislation "disregards entirely those of us who are interested in keeping American stock up to the highest standard—that is, the people who were born here". He believed that immigrants from Southern and Eastern Europe, most of them Catholics or Jews, arrived sick and starving and therefore less capable of contributing to the American economy, and unable to adapt to American culture. Eugenics was used as justification for the act's restriction of certain races or ethnicities of people in order to prevent the spread of perceived feeblemindedness in American society. Samuel Gompers, a Jewish immigrant and founder of the American Federation of Labor (AFL), supported the act because he opposed the cheap labor that immigration represented, despite the fact that the act would sharply reduce Jewish immigration. Both the AFL and Ku Klux Klan supported the act. 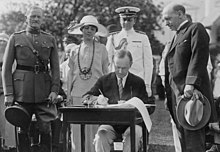 President Coolidge signs the immigration act on the White House South Lawn along with appropriation bills for the Veterans Bureau. John J. Pershing is on the President's right. Lobbyists from the West Coast, where a majority of Japanese, Korean, and other East Asian immigrants had settled, were especially concerned with excluding Asian immigrants. An 1882 law had already put an end to Chinese immigration, but as Japanese (and, to a lesser degree, Korean and Filipino) laborers began arriving and putting down roots in western states, an exclusionary movement formed in reaction to the "Yellow Peril". Valentine S. McClatchy, founder of The McClatchy Company and a leader of the anti-Japanese movement, argued, "They come here specifically and professedly for the purpose of colonizing and establishing here permanently the proud Yamato race," citing their supposed inability to assimilate to American culture and the economic threat they posed to white businessmen and farmers. Despite some hesitation from President Calvin Coolidge and strong opposition from the Japanese government, with whom the U.S. government had previously maintained a cordial economic and political relationship, the act was signed into law on May 24, 1924. The immigration act made permanent the basic limitations on immigration into the United States established in 1921 and modified the National Origins Formula established then. In conjunction with the Immigration Act of 1917, it governed American immigration policy until the passage of the Immigration and Nationality Act of 1952, which revised it completely. The act provided that no alien ineligible to become a citizen could be admitted to the United States as an immigrant. This was aimed primarily at Japanese aliens, but without explicitly naming them in the act. It imposed fines on transportation companies who landed aliens in violation of U.S. immigration laws. It defined the term "immigrant" and designated all other alien entries into the United States as "non-immigrant", that is, temporary visitors. It established classes of admission for such non-immigrants. The act set a total immigration quota of 165,000 for countries outside the Western Hemisphere (an 80% reduction from the pre-World War I average), and barred immigrants from Asia, including Japan and the Philippines (then under U.S. control). The act reduced the annual quota of any nationality from 3% to 2% of the number of foreign-born persons of such nationality residing in the United States in 1890 (though more recent censuses existed). The reduced quotas were set to last through 1927. No quotas on immigration from the Western Hemisphere were put in place. The act established preferences under the quota system for certain relatives of U.S. residents, including their unmarried children under 21, their parents, and spouses aged 21 and over. It also preferred immigrants aged 21 and over who were skilled in agriculture, as well as their wives and dependent children under age 16. Non-quota status was accorded to: wives and unmarried children under 18 of U.S. citizens; natives of Western Hemisphere countries, with their families; non-immigrants; and certain others. Subsequent amendments eliminated certain elements of this law's inherent discrimination against women. The act also established the "consular control system" of immigration, which divided responsibility for immigration between the State Department and the Immigration and Naturalization Service. It mandated that no alien should be allowed to enter the United States without a valid immigration visa issued by an American consular officer abroad. The National Origins Act authorized the formation of the U.S. Border Patrol, established two days after the act was passed, primarily to guard the Mexico–United States border. A $10 tax was imposed on Mexican immigrants, who were allowed to continue immigrating based on their perceived willingness to provide cheap labor. The act's revised formula reduced total immigration from 357,803 between 1923 and 1924 to 164,667 between 1924 and 1925. The law's impact varied widely by country. Immigration from Great Britain and Ireland fell 19%, while immigration from Italy fell more than 90%. From 1901 to 1914, 2.9 million Italians immigrated, an average of 210,000 per year. Under the 1924 quota, only 4,000 per year were allowed since the 1890 quota counted only 182,580 Italians in the U.S. By contrast, the annual quota for Germany after the passage of the act was over 55,000 since German-born residents in 1890 numbered 2,784,894. Germany, Britain, and Ireland had the highest representation in 1890. The provisions of the act were so restrictive that in 1924 more Italians, Czechs, Yugoslavs, Greeks, Lithuanians, Hungarians, Poles, Portuguese, Romanians, Spaniards, Chinese, and Japanese left the United States than arrived as immigrants. The law sharply curtailed immigration from those countries that were previously host to the vast majority of the Jews in America, almost 75% of whom immigrated from Russia alone. Because Eastern European immigration only became substantial in the final decades of the 19th century, the law's use of the population of the United States in 1890 as the basis for calculating quotas effectively made mass migration from Eastern Europe, where the vast majority of the Jewish diaspora lived at the time, impossible. In 1929, the quotas were adjusted to one-sixth of 1% of the 1920 census figures, and the overall immigration limit reduced to 150,000. The law was not modified to aid the flight of Jewish refugees in the 1930s despite the rise of Nazi Germany. 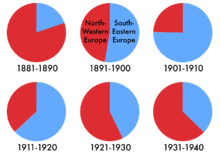 [c] The quotas were adjusted to allow more Jewish refugees after World War II, but without increasing immigration overall. During World War II, the U.S. modified the act to set immigration quotas for their allies in China and the Philippines. The immigration quotas were eased in the Immigration and Nationality Act of 1952 and replaced in the Immigration and Nationality Act of 1965. ^ However, on May 18, 1937, the Omnibus Immigration Bill entered Congress, which was intended to naturalize Jews who had entered the country illegally. It was voted for by a majority—mostly Republicans including future president Lyndon B. Johnson, and a few Southern "Dixiecrats". ^ a b c d e f Murrin, John M.; Hämäläinen, Pekka; Johnson, Paul E.; Brunsman, Denver; McPherson, James M. (2015). Liberty, Equality, Power: A History of the American People, Volume 2: Since 1863. Cengage Learning. ^ a b c d e f "The Immigration Act of 1924 (The Johnson-Reed Act)". U.S Department of State Office of the Historian. Retrieved February 13, 2012. ^ Fisher, Marc (January 28, 2017). "Open doors, slamming gates: The tumultuous politics of U.S. immigration policy". Washington Post. Retrieved 29 January 2017. ^ Matza, Michael (June 25, 2017). "Your immigrant ancestors came here legally? Are you sure?". Philly.com. Retrieved December 22, 2018. ^ Lodge, Henry (1909). "The Restriction of Immigration" (PDF). University of Wisconsin. Archived from the original (PDF) on 2012-03-06. Retrieved 2012-03-02. ^ a b Imai, Shiho. "Immigration Act of 1924". Densho Encyclopedia. Retrieved 2014-08-15. ^ Cannato, Vincent J. (2009). American Passage: The History of Ellis Island. New York: Harper. p. 331. ISBN 0-06-194039-9. ^ "Immigration Bill Passes Senate by Vote of 62 to 6". New York Times. April 19, 1924. Retrieved February 18, 2011. ^ "Senate Vote #126 (May 15, 1924)". govtrack.us. Civic Impulse, LLC. Retrieved 20 May 2011. ^ a b c Jones, Maldwyn Allen (1992) . American Immigration (2nd ed.). Chicago: University of Chicago Press. p. 237. ISBN 978-0226406336. ^ "Who Was Shut Out? : Immigration Quotas, 1925–1927". History Matters. George Mason University. Retrieved January 3, 2012. ^ Stephenson, George M. (1964). A History of American Immigration. 1820–1924. New York: Russel & Russel. p. 190. ^ Baynton, Douglas C. (2016). Defectives in the Land: Disability and Immigration in the Age of Eugenics. Chicago; London: The University of Chicago Press. p. 45. ISBN 978-0-226-36433-9. ^ Sohi, Seema (2013). Zhao, Xiaojian; Park, Edward J. W. (eds.). Asian Americans: An Encyclopedia of Social, Cultural, Economic, and Political History. ABC-CLIO. p. 535. ISBN 978-1-59884-240-1. ^ Murray, Robert K. (1976). The 103rd Ballot: Democrats and the Disaster in Madison Square Garden. New York: Harper & Row. p. 7. ISBN 978-0-06-013124-1. ^ a b c Historical Statistics of the United States: 1789–1945, Series B 304–330 (p. 32). US Bureau of the Census, 1949. ^ "A Century of Immigration, 1820-1924 - From Haven to Home: 350 Years of Jewish Life in America". Library of Congress. Retrieved February 10, 2019. ^ a b "United States Immigration and Refugee Law, 1921–1980". Holocaust Encyclopedia. Retrieved February 9, 2019. ^ Smallwood, James (March 2009). "Operation Texas: Lyndon B. Johnson, The Jewish Question and the Nazi Holocaust". East Texas Historical Journal. 47 (1). Eckerson, Helen F. (1966). "Immigration and National Origins". Annals of the American Academy of Political and Social Science. The New Immigration. 367: 4–14. doi:10.1177/000271626636700102. JSTOR 1034838. Lemay, Michael Robert; Barkan, Elliott Robert, eds. (1999). U.S. Immigration and Naturalization Laws and Issues: A Documentary History. Greenwood Press. ISBN 978-0-313-30156-8. Ian, Haney-López (2006). White by law : the legal construction of race (Rev. and updated, 10th anniversary ed.). New York: New York University Press. ISBN 0814736947. OCLC 213815614. Ngai, Mae M. (2004). Impossible Subjects: Illegal Aliens and the Making of Modern America. Princeton, NJ: Princeton University Press. ISBN 978-0-691-16082-5. Zolberg, Aristide (2006). A Nation by Design: Immigration Policy in the Fashioning of America. Harvard University Press. ISBN 978-0-674-02218-8.